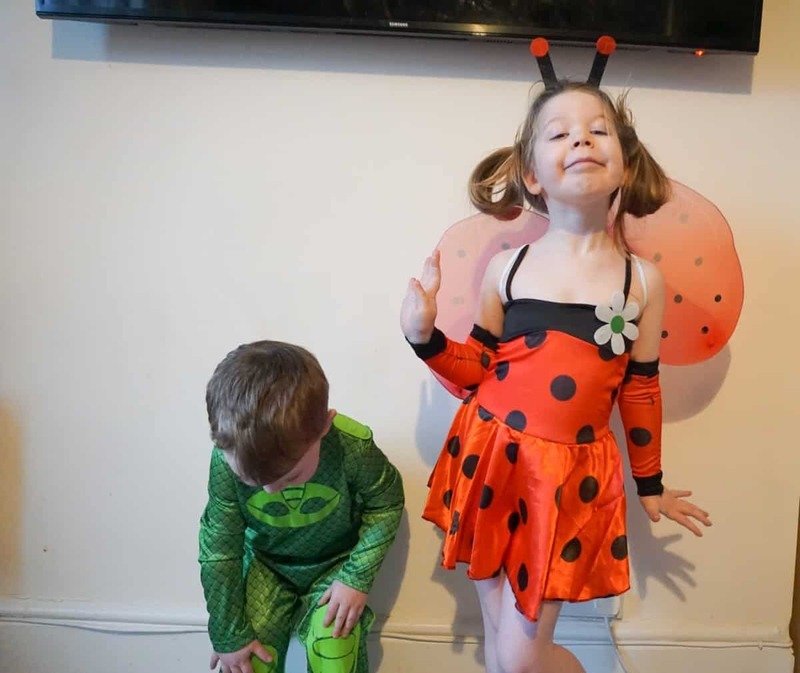 When Athena started preschool I was quite pleased to find out that things like World Book Day, where you have to come dressed as a character from your favourite book wasn’t really a big thing however now she’s started at school I’m feeling the pressure slightly! Next week on Thursday the 1st of March the school have asked all the children to come in dressed up as a character from their favourite book. It is optional but I don’t think Athena would want to be the one child sat in their school uniform when everybody else is dressed up! I obviously wanted Athena to enjoy picking her character and deciding who to go as, but I also want her to feel comfortable and able to learn in her costume too, plus it’s PE day on Thursdays so sh needs to be able to get into and out of it easily! 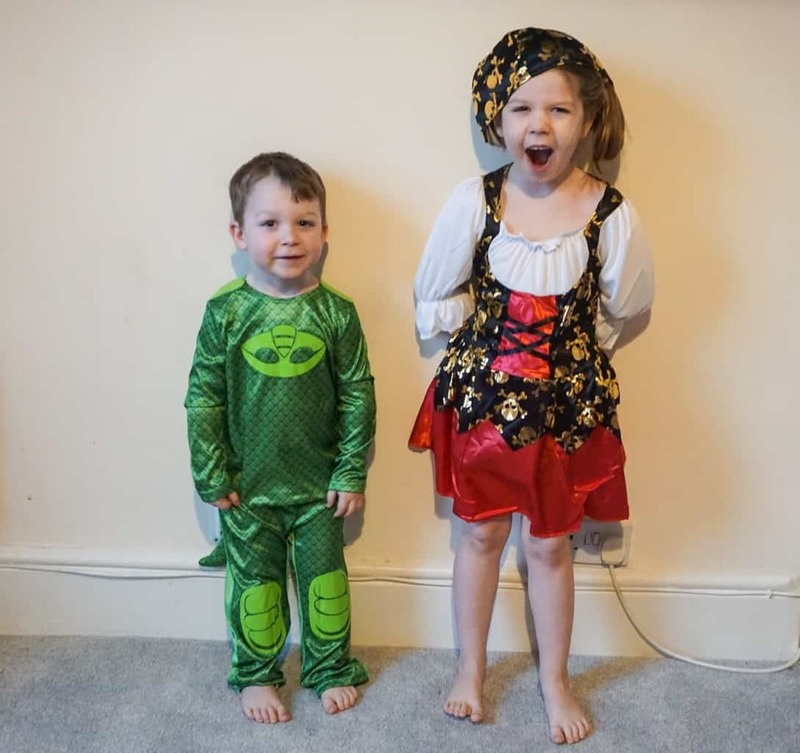 An email asking us if we wanted to choose some costumes from the Vegaoo website arrived Athena and I sat down and had a scroll through the World Book Day costumes and chose a couple of options because she couldn’t quite decide what you might want to be just yet! 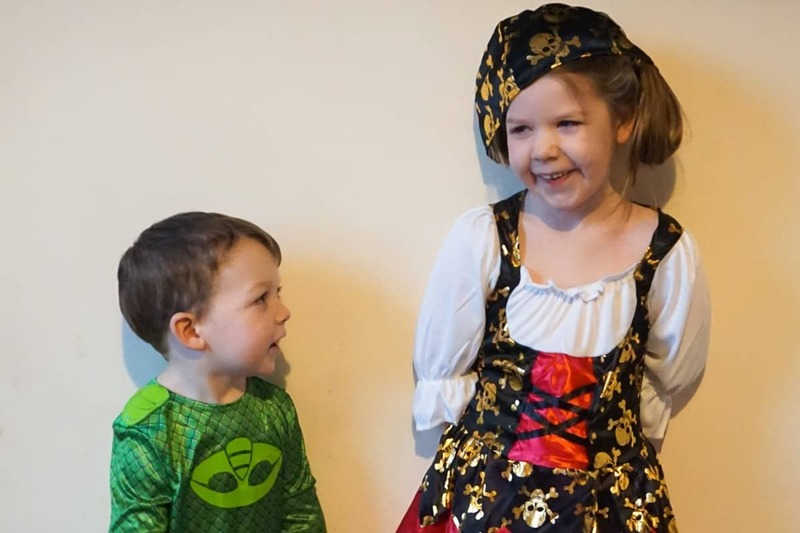 The first costume that grabbed her attention was a pirate girl outfit consisting of a pirate style dress with gold skull and cross bones all over and a bandanna. 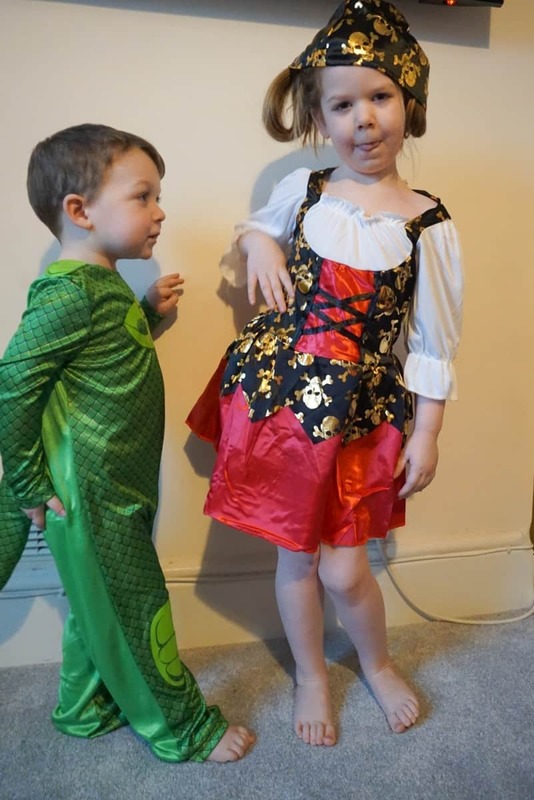 She said it reminded her of the book ‘Pirate Princess’ I think this outfit would be absolutely amazing on World Book Day with white or black tights and the Doc Marten boots she usually wears to school. We’d have to find her a plastic sword as well and maybe even an eye patch and parrot to go the whole hog! 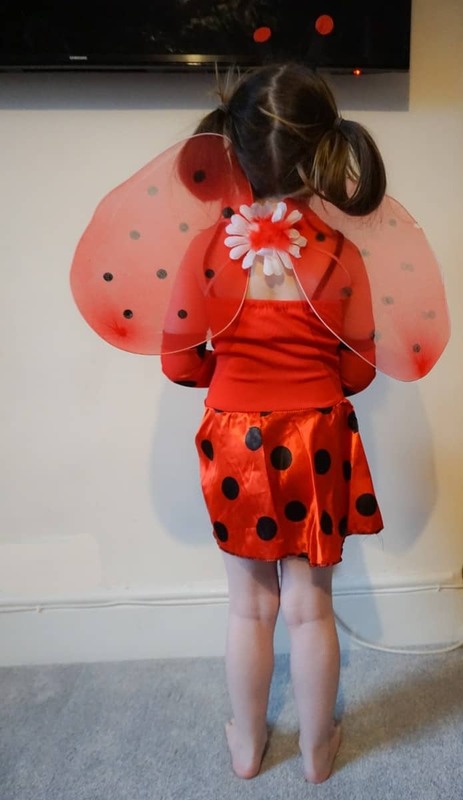 The other costume that she picked is a Ladybird costume which comes with a headband with antennae, wings, little spotty sleeves and of course the dress! ‘What the Ladybird Heard’ is one of Athena’s favourite books we read it at least once a week, so I think this will be the one she goes for in the end but she’s know to change her mind at the last minute so who knows! 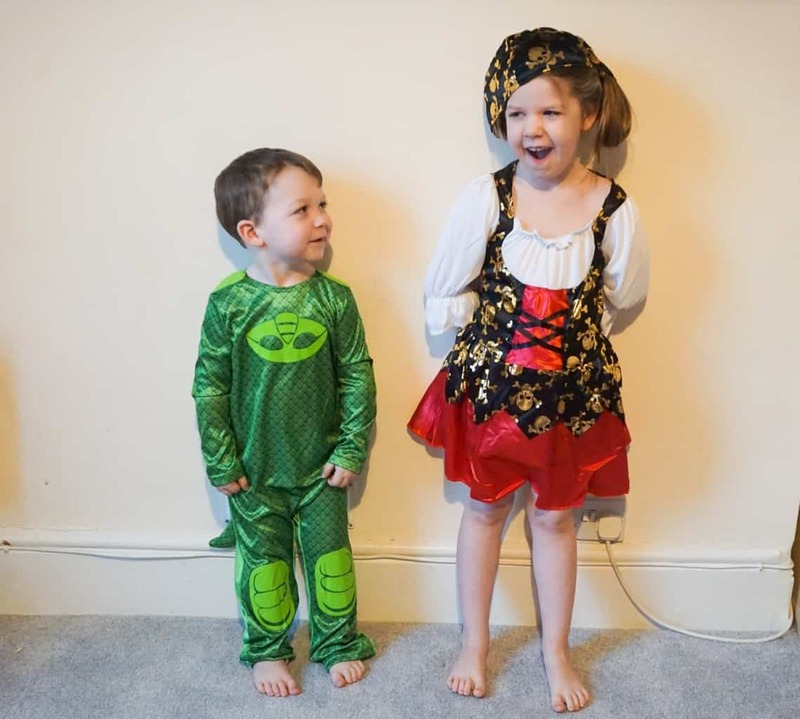 The Pirate Girl dress is roomy enough that she will be able to wear it next year for World Book Day I reckon! In the mean time it will live in our dressing up box for role play at home and when friends come over full! Arlo wasn’t left out either and he was able to choose a costume for himself too. Because he is not at preschool yet he won’t officially be celebrating World Book Day this year, so I let him choose whatever he wanted. A couple of weeks ago we met Gecko and Owlet when we went on a steam train adventure and ever since then he has been even more obsessed with PJ Masks! So when I showed him that there was a whole PJ Masks Costume category he got pretty excited and the choice was easy! It’s a really easy to wear costume, with velcro fasteners up the back nice and is made of really stretchy material so is nice and comfy! There is a padded tale too, that attaches with Velcro. The tail doesn’t stay put for very long as Arlo is really active so I think I might need to add couple of stitches to make it a bit more of permanent feature but he’s loving wearing it and even wore it on the school run this morning with us! There are absolutely loads of choices for kids and adults on the Vegaoo website, delivery is really quick and you’ll be spoilt for choice! We were sent these outfits to review, all words an opinions are my own. 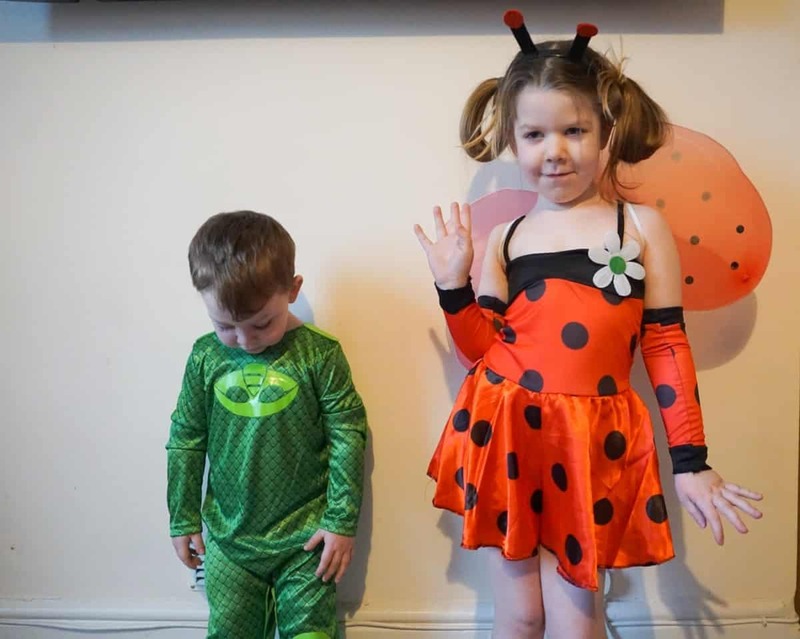 The ladybird costume is so cute, they both look adorable. I’m kind of sad Poppy can’t get dressed up as she doesn’t go to nursery on a thursday! Oh I love the ladybird costume, my Holly would love it too. This is also one of her favourite books. Her preschool are terrible for telling us last minute and I’m expecting a last minute email from them about it! Very cool outfit choices. There are a good number of people at our school that make their own, but that is never going to happen in our house. I’m all about ease and buying costumes that they can also play in is definitely the best idea.